The election is also a referendum on the leadership of Superintendent Robert Runcie, who is supported by the nine-member board's majority but is criticized by some victims' families over policies both before and after the shooting. That includes the pace of a seven-year, multimillion-dollar safety improvement plan voters approved in 2014. Ryan Petty, whose daughter Alaina died in the attack, is challenging two-term incumbent Donna Korn for a countywide seat. Lori Alhadeff, whose daughter Alyssa died, and Tennille Doe-Decoste, whose son's best friend Joaquin Oliver also perished, are vying for an open seat representing the Parkland-area district that includes Stoneman Douglas. Elsewhere in the county, two-term incumbent Laurie Rich Levinson is being challenged by former Stoneman Douglas teacher Richard Mendelson, who was close friends with coach Aaron Feis, who died. The Broward Teachers Union has endorsed Korn and Levinson, both Runcie supporters, while Stand With Parkland, a group composed of the 17 victims' families, is calling for their ouster. Alhadeff and Doe-Decoste have focused on issues, but the Korn-Petty and Levinson-Mendelson races have gotten personal. Petty said he never thought about running for the board before his daughter's slaying, but it made him realize school boards make "life and death decisions." "What I had hoped to see after Feb. 14 was an acknowledgement that mistakes were made and a recognition that change was needed, but I have yet to see that," said Petty, who was appointed to a state commission investigating the shooting. He and other parents criticized Korn for recently telling district administrators they'd had "an amazing year," saying it showed insensitivity. Korn apologized, saying she was referring to the district's academic success but it was her fault she was misunderstood. Korn said school security became the board's priority "long before the tragedy," but added she also is frustrated with the security program's sometimes slow pace as it moves toward its scheduled 2021 completion. Meanwhile, she said, the district has made strides academically. Her campaign has attacked Petty over Twitter posts he made between 2008 and 2013, saying they show bigotry toward racial, sexual, and religious minorities. For example, in 2010 Petty re-tweeted a post calling the African-Americans at an Al Sharpton rally "New Black Panthers. In 2011, he re-tweeted a link to an article entitled "Lying, Hitting Your Wife and Jihad: Just Another Day in a Moderate Mosque." He also called people "libtard" and opposed gay marriage. "What is reflected in those tweets is nothing that I would ever myself share with anyone or joke about," Korn said. Petty apologized, saying while some tweets are being taken out of context, in others, particularly about politics, "I used some language that I wouldn't use today." "Unlike the board and my opponent, I have stepped up and taken responsibility," Petty said. There is a third candidate in the race, 19-year-old Elijah Manley, who has mostly been ignored by the other two. If no candidate gets a majority, a November runoff will be held. 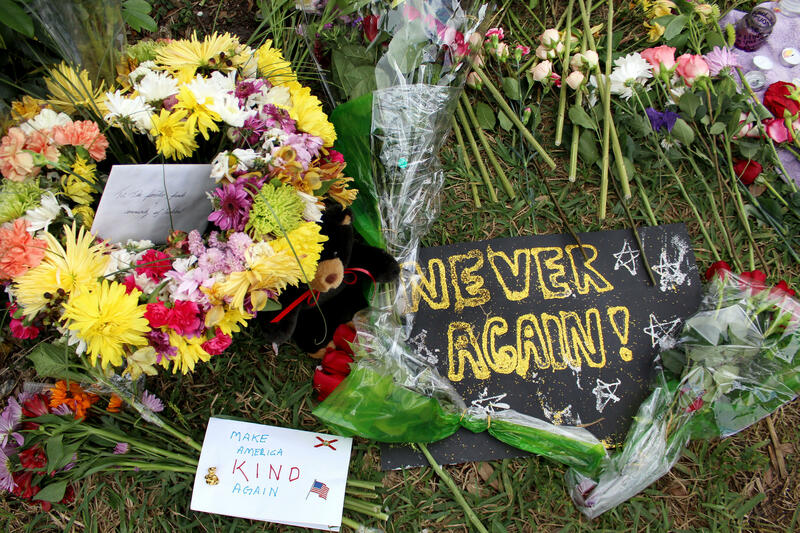 Mendelson, who taught psychology and social studies at Stoneman Douglas from 2002 to 2014, served on the school's safety committee when the three-story building where the massacre occurred was constructed 10 years ago. He said he warned the building would be a "shooting gallery" if a gunman attacked because of its long, straight hallways and poorly designed classrooms. He said an administrator called him "alarmist and a moron" because nothing happens in Parkland, a well-off suburb. That attitude, he said, never changed among administrators and the board, but then they tried to escape blame after the shooting. "If there was honor or integrity in any of those people ... they would have owned it," said Mendelson, who is now a university professor. Levinson said the district has assessed security at all schools and made improvements including single-point entry at most schools and adding 10,000 surveillance cameras. She said Mendelson and his supporters have harassed her and her family while campaigning, calling her a murderer and telling parents they shouldn't vote for her if they want their children to live. "There are ways to conduct oneself, and that's not it," she said of Mendelson. Mendelson denied the accusation. "It is absolutely not true." Levinson and Mendelson are the only two candidates, meaning Tuesday's winner is elected. The “Big Pro Gun Rally” and the March for Our Lives rally both took place in downtown Tallahassee this weekend.